RainTrap is the new, inexpensive underground rainwater storage and delivery system from the market leaders in rainwater harvesting. The RainTrap will collect rainwater from the roof via the existing guttering and downpipe system on the property. The integral leaf filter will remove unwanted debris washed down from the roof thus ensuring good quality stored water. The system is supplied with a 30 metre hose, connected to the integral water pump. A simple on/off switch will operate the pump, allowing it to deliver the stored water under pressure to where it is needed. 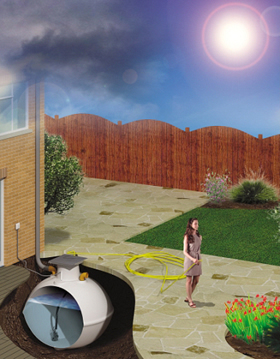 The system can be used all year round to water the garden, operate a sprinkler or wash the car.